But we must temper our desire for perfection knowing full well that we cannot alter the entire vessel that is our soul all at once. Only by testing, by trial, by change and by learning can we ever hope to possess the perspicacity to function according to our will. Much like other sea-going vessels our soul cannot be completely re-fitted in the middle of is voyage. You cannot remove all the rotten planks and timbers at once or you will find that you are at the bottom of the ocean. No we must make one or two adjustments at a time and trust that our vessel will get us to where we long to go. There is no "Truth" for us folks, no ideal, no purity of life... there is only the human nature that pushes us beyond ourselves... a desire to be that which we currently are not... an eternal gnawing dissatisfaction that fuels our journey toward God. But in order to be what we are we must also realize that it is not our nature to 'be' (what we want to be) but rather our nature to 'become'. We must have patience with ourselves, we must allow ourselves to 'become' and not require ourselves to already 'be'. I have enclosed the heat exchange unit since I have completed calibrating it so that it will not yield more than 20% of it's power at a time, which will prevent me from again melting the solder on the copper heat-exchange pipe. I have also mounted and enabled a temperature controller that will control the temperature of the sparge water in the sparge tank. And this tub should do nicely for draining the remaining liquids from the lines once the mash is complete. 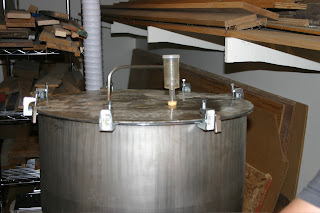 And finally I would like to highlight my favorite component so far, our fermenter. Tim and Brian seem to have created the stand for it, carefully calculating the exact height for draining the kettle into it. ;) Tim and I later added some foam rubber weather stripping and clamps for an airtight seal, and then mounted the bubble trap on the top to allow CO2 release without danger of infection. i love that second paragraph - the tempering our desire to wipe out our vessel when out to sea - but instead having patience with the journey. do we have an eta on the imperfect becoming of this beer?